Kathryn R. Wall has been writing the Bay Tanner mysteries for a number of years and has eleven books to her credit, although I had not heard of her and just stumbled onto her website recently. 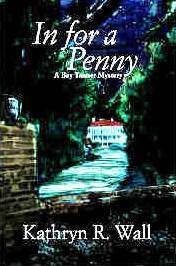 So I selected her first book, In for a Penny, as my first read, just to get a sense of the beginning of the Bay Tanner story. The series is set in the South Carolina Lowcountry, specifically Hilton Head Island and nearby Bluffton. Her descriptions of this beautiful area are just lovely, and bring back fond memories for me, as I vacationed in this area for many years. She also does a fine job of portraying the conflict between those who want to develop this pristine area and those who wish to preserve its quiet natural beauty. On a personal note I must add that, sadly, the developers appear to be winning this battle. Bay’s life has been shattered by the violent, untimely death of her husband, but when an old friend of the family asks for her help, Bay feels compelled to come out of her shell. She is soon thrown into the middle of a shady land deal, and her snooping around makes her a liability and a target for those who wish to silence her. She becomes determined to get to the bottom of this scheme and in doing so uncovers other secrets her “old money” friends and family have been keeping. Along the way Bay also finds the courage to take her first steps toward making a new life for herself. I enjoyed this book especially because of the author’s excellent feel for the main character’s thoughts and emotions, in addition to conveying the non-verbal communications between her characters. Of course, I loved the setting too, so that was a big plus. I can’t wait to read more from Kathy!